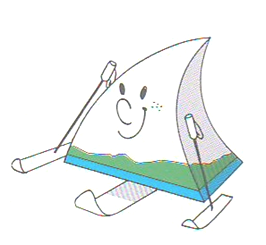 The official mascot, Alpy, designed by Vincent Thiebaut, represented the summit of the Grande Motte mountain in Tignes. Alpy was shown on a mono-ski to demonstrate its athleticism and the colours of white, green and blue were used to represent purity/snow, hope/nature and discipline/the lake. Following a competition, an illustrator by the name of Tor Lindrupsen won with his children’s drawing of Sondre. Sondre is apparently a friendly teenage troll boy who is charming, good-natured, elegant and poised despite having had his left leg amputated above the knee. 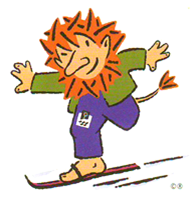 The name for the mascot was chosen in a separate competition and derives from the great skiing pioneer Sondre Nordheim. 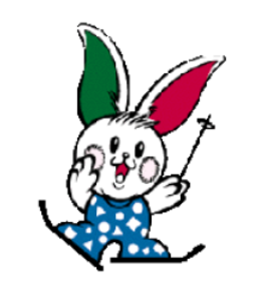 The mascot chosen for the Games was based upon the same rabbit emblem selected for the logo. A national competition was held to name the mascot and following 10,057 entries which suggested 3,408 different names the winning name chosen was Parabbit. 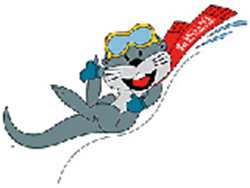 The Salt Lake organisers chose the otter as the official mascot for the Games because they considered it to embody vitality and agility. The otter also had a long historical connection with the region stretching back to ancient Indian tribes who believed it to be one of the most powerful of all animals. Having been nearly hunted to extinction in the early twentieth century and the river otter was successfully reintroduced to Utah in 1990. 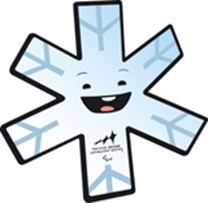 Designed by Pedro Albuquerque, Aster the snowflake aims to depict the originality of Paralympic athletes, rather than focusing upon their disabilities. The complexity and originality of a snow flake expresses through its limits an original way of practicing sport at the highest competition level. Sumi is an animal spirit who lives in the mountains of British Columbia. Like many Canadians, Sumi’s background is drawn from many places. He wears the hat of the orca whale, flies with the wings of the mighty thunderbird and runs on the strong furry legs of the black bear. Sumi’s name comes from the Salish word “Sumesh” which means “guardian spirit.” Sumi takes his role very seriously. He works hard to protect the land, water and creatures of his homeland. Transformation is a common theme in the art and legend of West Coast First Nations. Transformation represents the connection and kinship between the human, animal and spirit world. Revered animals, such as the orca whale, the bear and the thunderbird, are depicted in transformation through masks, totems and other forms of art. The orca is the traveller and guardian of the sea. The bear often represents strength and friendship. And the thunderbird — which creates thunder by flapping its wings — is one of the most powerful of the supernatural creatures. The word Örnsköldsvik literally translates as ‘Eagle shield’s bay’. 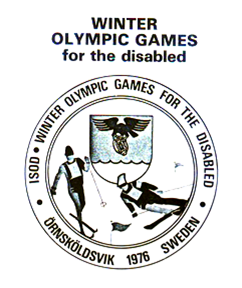 The logo for the Örnsköldsvik winter Olympic Games for the Disabled, therefore, consisted off an eagle carrying a shield over water flanked below on either side by an alpine and a cross country skier – the two sports contained within the Games. 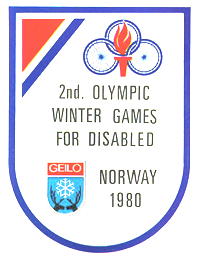 The logo for the Games consisted of the Geilo city emblem at the time of a stylised snowflake held between the antlers of two reindeer facing each other and the three wheelchair wheel logo of the International Stoke Mandeville Games Federation (ISMGF) combined with a flaming torch. 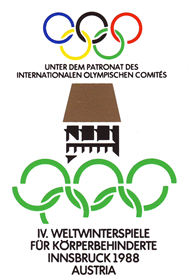 The inclusion of the ISMGF logo hints at the power of ISMGF, or possibly Dr Guttmann who was President of ISMGF and ISOD, given that it was ISOD who founded the winter Games. The logo for Innsbruck was a combination of three parts. The centre of the logo shows a stylised depiction of the Goldenes Dachl (Golden Roof) – one of Innsbruck’s most famous landmarks. Above this was the Olympic rings, which the IOC had agreed to the use of based upon certain conditions. Below the Golden Dachl was five broken rings aimed at depicting the disability of the participants taking part. It also contained the words ‘Under the patronage of the International Olympic Committee’ beneath the Olympic rings. The logo used in 1988 was exactly the same as used in 1984. It was a combination of three parts. The centre of the logo shows a stylised depiction of the Goldenes Dachl (Golden Roof) – one of Innsbruck’s most famous landmarks. Above this was the Olympic rings, which the IOC had agreed to the use of based upon certain conditions (see chapter 10). Below the Golden Dachl was five broken rings aimed at depicting the disability of the participants taking part. It also contained the words ‘Under the patronage of the International Olympic Committee’ beneath the Olympic rings. 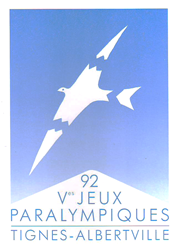 A bird with broken wings, soaring high across the peak of a mountain was the image, designed by Jean-Michel Folon, used to reflect the sporting abilities of the athletes at the Tignes-Albertville 1992 Paralympic Winter Games. The main illustration, depicting the sun people, aimed to evoke feelings of power, vitality, strength and energy, all of which are characteristics of disabled athletes. This was the last time the five tae-guks was used in connection with the Paralympic Games or the International Paralympic Committee. 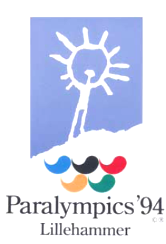 The logo design selected for the Nagano 1998 Winter Paralympics was designed by Sadahiko Kojima following the announcement of a national competition. It represents a simplified form of the Chinese character ‘naga’ for Nagano. It also symbolises a rabbit jumping and playing in snow or on ice with the swift movements that are characteristic of rabbits. 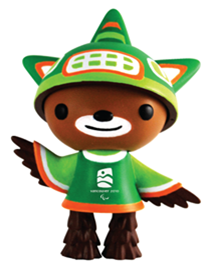 This figure was combined with the Games details and the former IPC logo of three tae-guks. The logo for the Salt Lake Paralympics can be split into three distinct parts making up the whole. 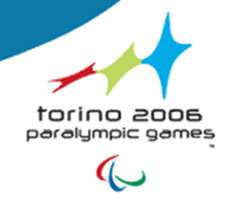 The sphere at the top represents both the global unity of the Paralympic Movement and also the head of the Paralympic athlete, which the overall logo appears to depict. The two broad fluid lines represent the athlete in motion with the three tae-guks, the former IPC logo, beneath the athlete. The three graphic shapes at the top of the logo aim to symbolise the human figure and their soaring motion aims to convey energy, joy and the desire to reach ever higher. The IPC logo at the bottom represents both the Paralympic movement and as well as its motto of Mind, Body and Spirit. Finally the logo colours of blue, green and red, being the colours of the IPC logo were reinterpreted to depict the distinguishing colour of Italian sport, as well as the colour of snow and ice (blue), nature and the Italian landscape (green) and passion, which expresses vitality, enthusiasm and willpower (red). 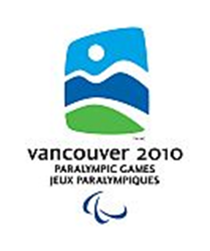 The Vancouver 2010 Paralympic Winter Games Emblem represents the spirit of the Host Region, the Paralympic athlete’s journey and the harmony that exists between the athlete, their sport and the environment. The emblem captures the image of Vancouver and Whistler’s lush coastal forests, dramatic mountains and majestic sky — a natural theatre that will inspire Paralympians as they reach the pinnacle of sport and human achievement in 2010. The emblem also reflects the athletes’ mountainous inner strength and personal transformation as they push themselves to new heights in the pursuit of excellence. A dynamic human form is created by the valley, mountains and sun of the West Coast. This design honours the harmonious relationship by suggesting that the athlete and mountain are one.